Many may think that men have it easy when it comes to getting ready for an important date or function. Pants, shirt and tie and that’s it – they are good to go! But what about accessories? There are a plethora of things to choose from and one of the most important would have to be a quality watch, such as the G Shock GA110 1B Military Series Watch, a black resin quartz watch with a digital dial. The G Shock GA110 1B Military Series Watch Black is a stylish, tasteful timepiece with many great features and offers even the most tech-savvy man with ample attributes to keep him happy. This military watch is suitable for a range of uses, from looking professional at the office, to being rugged enough to take on some serious sporting activities. Casio once again has managed to combine stylishness with durability in the black resin band and case, with precision time-keeping in the superbly accurate quartz movement. The watch has a solid build and yet is pleasingly light enough to wear, without feeling too heavy or cumbersome. And to add to the mix, the G-Shock also features water resistance up to 200 meters, is shock-resistant, and has a chronograph, timer, and alarm. This is robust and chunky with a definite masculine feel to it and has a diameter of 5.1cm and a pleasingly slim depth of 14mm. The case is created from resin which gives superb durability, offering great protection against many mishaps, such as dropping it into water or onto a hard floor. The case is both waterproof and shock resistant, meaning you need never worry, even if you are one of nature’s heavy-handed individuals! The dial face is protected by scratch-resistant resin and has a stylish black surround with subtle tones of grey to complement the classy look and feel. However, due to the durability of the resin case, it is also a watch will not be out of place in any sporting arena. It’s easy to see the time anywhere due to the clear and readable digital and analog display. 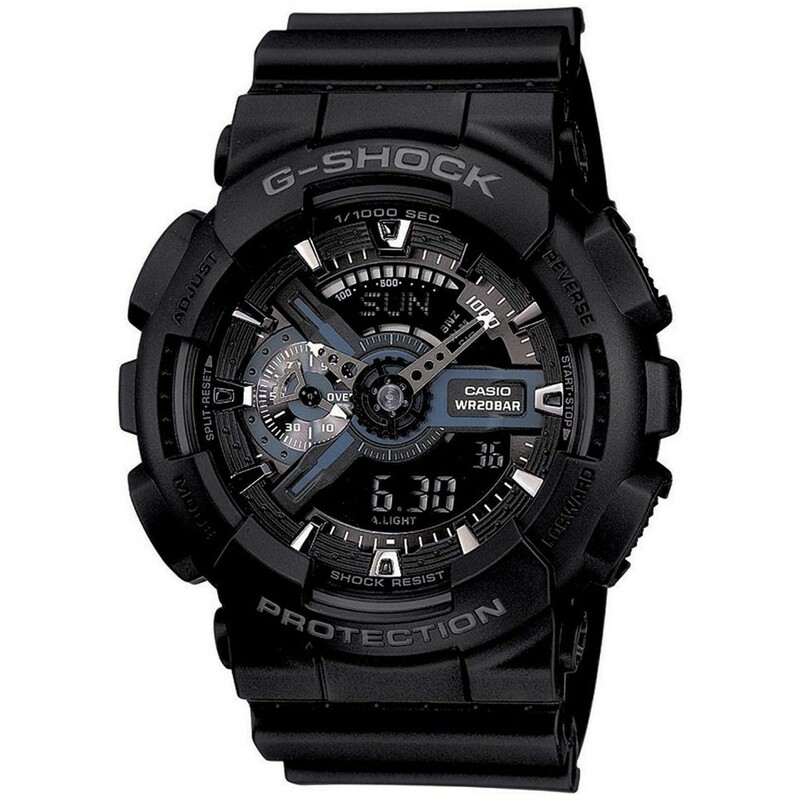 The Casio G Shock GA110 1B watch has a black band with a width of 29mm and is a standard length suitable for a man’s wrist. The band is built from durable, hard-wearing resin which gives great protection from the elements and is also shock-resistant and is fastened with a quality buckle for ease of use. The stylishly, classic black band will complement any outfit and yet still will not look out of place in the sports field. This Casio watch has a really useful glow in the dark feature, making it possible for use in a range of situations. This would most definitely suit those who enjoy night fishing or other pursuits, such as camping. There is 1 LED light at the 6 o’clock position which illuminates the analog section of the watch, so you can easily see the time. The light reflects on the chrome hour markers, giving the illusion that there are small LEDs all around the face. Other features found in this G Shock watch include a calendar with the day, date, and month; a Quartz movement for supreme reliability; a chronograph, meaning it can be used as a stopwatch and timer; a battery with a 2-year life, meaning you are unlikely to need to replace it very often. Ideal for fashion-wear, but also sports and outdoor activities. The watch is both shock- and water-resistant. Stylish black and subtle grey coloring, making it suitable for great time-keeping in any surroundings. Constructed from durable, quality resin to ensure longevity. The watch has a long battery life. Additional functional and useful features such as stop clock, timer and calendar mean that this watch is an ideal choice for those who enjoy a range of activities. Q: Does this watch have a background or night vision light? Q: What material is the face made from? Q: Is the band adjustable for different wrist sizes? A: As it has buckle latches,(like a belt,) yes, it is adjustable. The G Shock GA110 1B watch is durable, reliable and stylish. Despite the fact that the watch is super-stylish, it is also extremely affordable. The rugged construction of this watch means that it is suitable for outdoor activities and sports. The G Shock has a long battery life, meaning you are unlikely to go to the expense of several replacements during its life. There is no need for concern when using this watch for outdoor activities as it is both shock- and water-resistant. It is a well-designed watch with many useful features. The only issue would be that the glow in the dark feature is not all that it could be, but you would have great difficulty in finding anything to match up to this watch in the same kind of price range. I feel the watch is super value for money and would make a great gift.